Elementary and junior high school students - Free. ※Visitors can also view regular exhibits. ※We perform some display substitution during this period. Those in brackets ( ) are discount charges for groups of more than 20 people, people of universities and the like* who use this facility as part of their classwork, high school students writing reports, repeat visitors within 3 months after the last visit, and people 65 years old and older (certification required). Those holding physical disability certificates may enter free of charge with one attendant. On every Saturday, high school students may enter free of charge. Please receive a pass permit at the attendant window of the Natural culture garden (center gate, west gate, north gate). 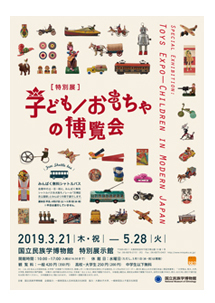 For high school students, university students and general public, please buy museum admission tickets at the window of the Natural culture garden (center gate, west gate, north gate). You can pass through the garden free of charge. For elementary school children and middle school children, when you wish to pass through the Natural culture garden (pay area), please notify the attendant at the window of the Natural culture garden (center gate, west gate, north gate) “I am going to MINPAKU” and receive a pass permit. From the east gate, you can come to this museum without passing through the Natural culture garden (pay area). When you are going to the Natural culture garden (pay area), you should pay the admission fee. A shuttle service from Bampaku-kinen-koen Station on the Osaka Monorail Line to the National Museum of Ethnology operates during the exhibition period. Please use our shuttle bus service. ◆The service is available on Saturdays, Sundays, and National Holidays between March 21 (Thursday) and May 28 (Tuesday). ※Might be temporarily unavailable when the Expo '70 Commemorative Park holds an event.